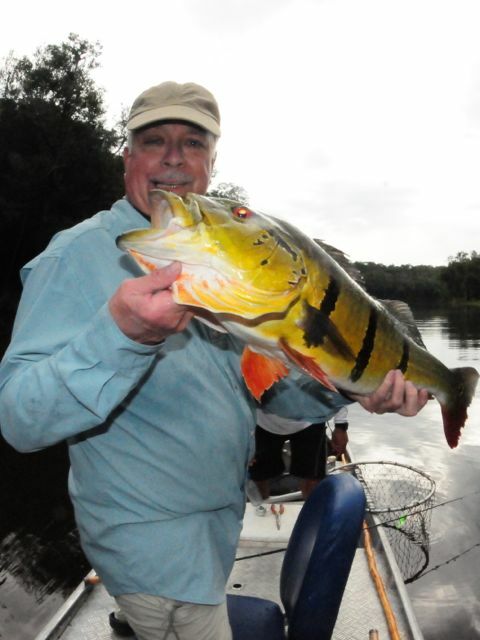 Peacock Bass Fishing Brazil – 2016 – Day Four – Were they Naked or Neck-ed? We’re up at 5:30 and are ready for breakfast at 6. Breakfast is homemade chocolate-yellow bread, homemade dough balls with gooey stuff inside, fresh pineapple, slices of melon, fried eggs and pieces of white bread. It’s plenty to get us going. Before we leave the dinning room, we make sandwiches, which consist of cheese with mustard on the world’s driest bread. (We avoid the lunch meat that we think messed up Mark’s intestines in 2013). Our sandwiches are wrapped in plastic wrap by Fabiano, the cook helper, and placed in a rectangular Tupperware container. To that, we add some leftover pineapple, a slice of melon I’m not sure how to eat nicely without a fork, and a piece of chocolate-yellow leftover from breakfast. Mark’s 12-pounder is a beauty and the biggest peacock we’d get all day. On the other hand, you can’t beat the beauty of a wolf fish, or Traira. Me and my toothy wolf fish pal. 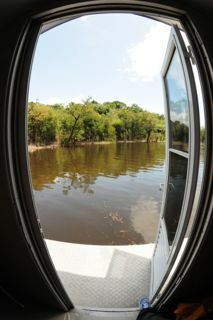 We spend the day going in and out of narrow bodies of water, that lead to wide, vast lagoons. 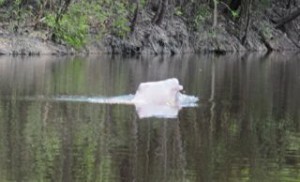 We have lunch with a pink dolphin at an inlet to a lagoon. I take a dozen photos, none of which are any good at all. We also do a pee break. Now, being a woman, a pee break is a big deal, because my goal is to get out of range of the guide and not get nabbed by a snake, especially a poisonous one. And that’s a big deal, especially since our guide pointed at something on the water earlier and yelled “Cobra!” which means snake. Luckily, the cobra was just some vegetative fuzz, but it did worry me that he worries about snakes. I thought our Amazon guide was supposed to be fearful. Piece of fuzz that from a distance, Sappo thought was a “Cobra,” or snake. The other thing about peeing in the Amazon is that the ground consists of unconsolidated layers of thick, fallen leaves, making the ground springy to walk on. It’s not unlike walking on a trampoline, except that I don’t know what’s underneath. So I hustle quickly on the springy ground, looking forward for snakes, backwards at the guide, until I finally find a spot behind a rise or tree. I go about my business, only to discover that by the time I’m done, I’ve sunk down 8 inches into the soil and leaves. I try not to think about whether tarantulas and snakes like to hang out under leaves, as I hastily pull up my pants, step off to one side onto higher ground, and hustle back across the springy vegetation to the boat. There, my dear Mark is waiting for me, having handily peed next to the boat. What’s the adventure in that? Having survived a pee break, we head down a narrow body of water, and without warning, the quiet vibration of our electric motor scares some tiny proboscis bats out of a tree. They fly out of the tree and land on the bark in the sun. It seems like a stupid thing to do to me—fly out of the protection of the inside of a tree to sit outside on the tree where predators can get you. But it provides a great opp to shoot a few photos. 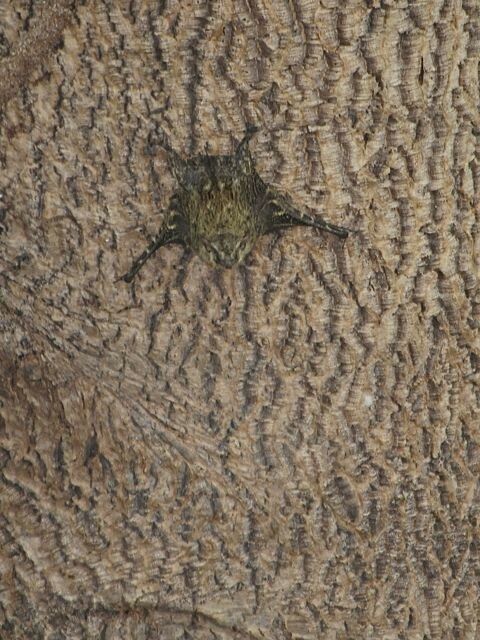 These bats are only 2.4 inches long. The only other time I saw some was in Costa Rica while on a cruise with my dad in 2003. A proboscis bat, also called a river bat, amongst other names. After lunch, I set the hook on a fish, only to see the top 2/3 of my rod floating in the water and the bottom 1/3 in my hand. It’s my green and white rod, the one that replaced the custom-built one Mark had made for me for the 2013 trip, which had also broken. The original rod was green with white guide wraps (because I’m an MSU Spartan), with my name and peacock bass on it. After the first one busted, Mark asked the maker to replace it; a year later we got a rod without my name or bass on it, and on its first use, it breaks, too. So much for those rods. 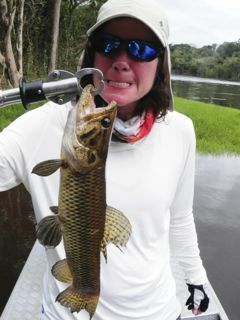 Evidence showing why one brings extra rods to the Amazon. 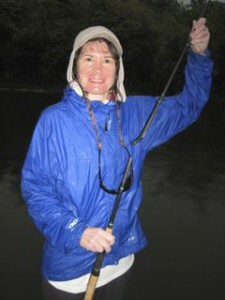 In spite of my rod, I keep winding and we get the fish netted. I reel in the rest of the rod, Sappo cuts the lure off and puts it on another rod. Thankfully, we brought six rods, so still have plenty to choose from. While I’m struggling with my gear, we see a green kingfisher make fishing look really easy. 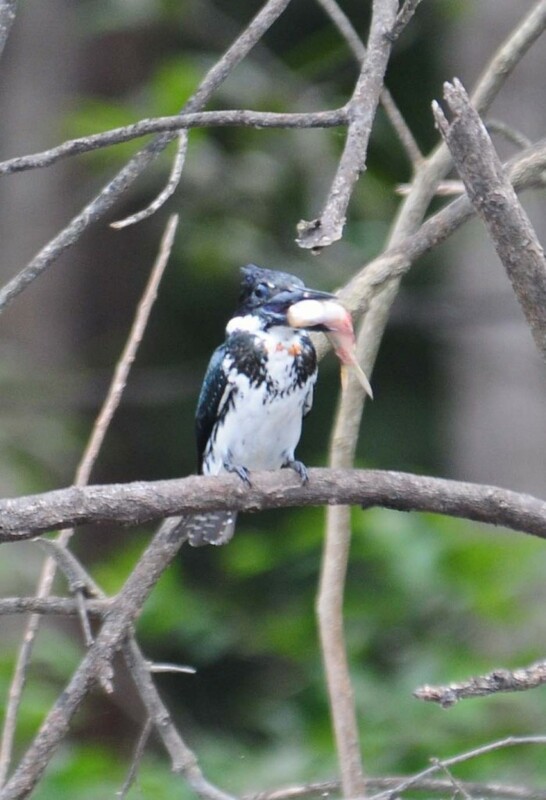 Green kingfisher with what may be a fish. It rains on and off lightly until around 3:30 when it pours…till nearly 4:00. 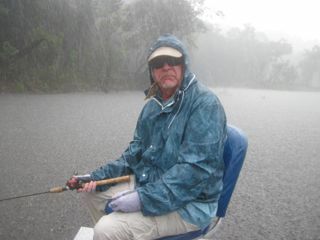 Mark enjoying a wee Amazon rainfall. 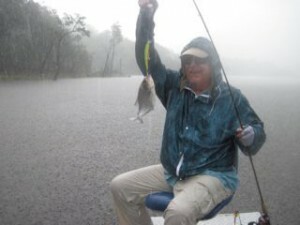 Mark took advantage of the rain to catch a piranha. 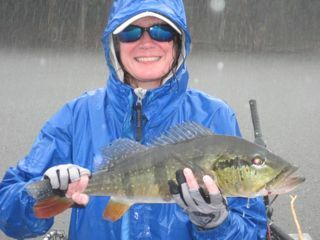 Mark showing a little rain can’t stop him from catching piranhas. I took advantage of the rain to catch a peacock bass. My rain gear is not up for the rain and humidity combo, and with no rain pants, it’s a chilly ride home. I go right from wet clothes to a shower and never felt so good drying off. We go to the dining room to have a couple of beers and share the day’s stories. Bobby got several large fish (like 8,10,11, and 12 pounds) and Dr. Coz got a 15-pounder. Dr. Coz would later say that he “sure as hell wouldn’t bet against Bobby cuz he’s a fishing machine!” Bobby is impressed with the 82-year-old Dr. Coz because he never asks to take a break and fishes with Bobby cast for cast. Dr. Coz is wearing a colorful lightweight jacket and Dr. Bob rags on him about how “The outfit is something queers might wear.” Mark mentions that wearing that in San Francisco would ensure he’d never be lonely. Dr. Coz has done several marathons and the jacket is from the 1996 marathon. He’s proud of it. He also used to do triathlons. Other stories emerge, including Bobby being super sick on one trip to the Itapara (before he met us). He said he had a 104 degree temperature and spent the day puking, sleeping, fishing, and then doing that all over again. Curt says it was the first time he out-fished Bobby. Bobby claims he got ill due to eating some “giant rat meat” he’d had for dinner, which Curt had declined. They’d slept in hammocks one night, and Bobby said it’s bad enough sleeping in a hammock; it’s horrible in a hammock when you’re sick. Steve tells of when he and Dr. Coz were on another trip and Coz had his own tent and was making strange, moaning noises on and off all night. When Steve imitates the noise he sounds like an ill cow. He says it wasn’t until morning that he learned the noise from Coz was because he was suffering from really bad leg cramps. Dr. Bob shares his story of Steve getting up in the middle of the night last night to use the bathroom. Steve was apparently turned around and didn’t realize there was no external light switch outside the bathroom. According to Dr. Bob, Steve tried every switch in the cabin before he finally discovered all he had to do is open the door and the light went on in the bathroom. Somebody mentions the fact that the light in the cabin bathrooms only stays on for perhaps a minute. When the lights go off, the user of said bathroom has three choices: 1) open the door to turn the light back on; 2) wave one’s arms over one’s head to get the light to go back on; or 3) sit in the dark. Opening the door always works but it’s disruptive to one’s roommate. Waving one’s arms works about half the time. Sitting in the dark meant that the cockroaches could be out running around. Let’s just say I did a lot of waving while in the Amazon. Good stories, and great, funny guys. I suspect the stories will only get better when I leave, though, so Mark and I depart and leave them to their tales. It’s sprinkling a little outside, but 10 minutes later it pours and we go to sleep to the sound of rain pouring on the cabin’s metal roof.